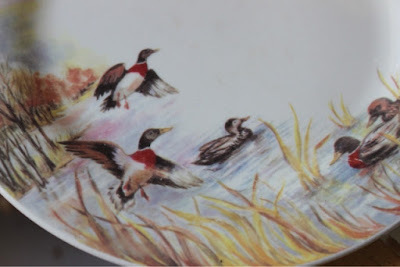 Right after I met my husband in 1994, he bought a set of dishes...these dishes (below) with the ducks on them. He's a big duck hunter so his whole apartment was decorated with waterfowl. 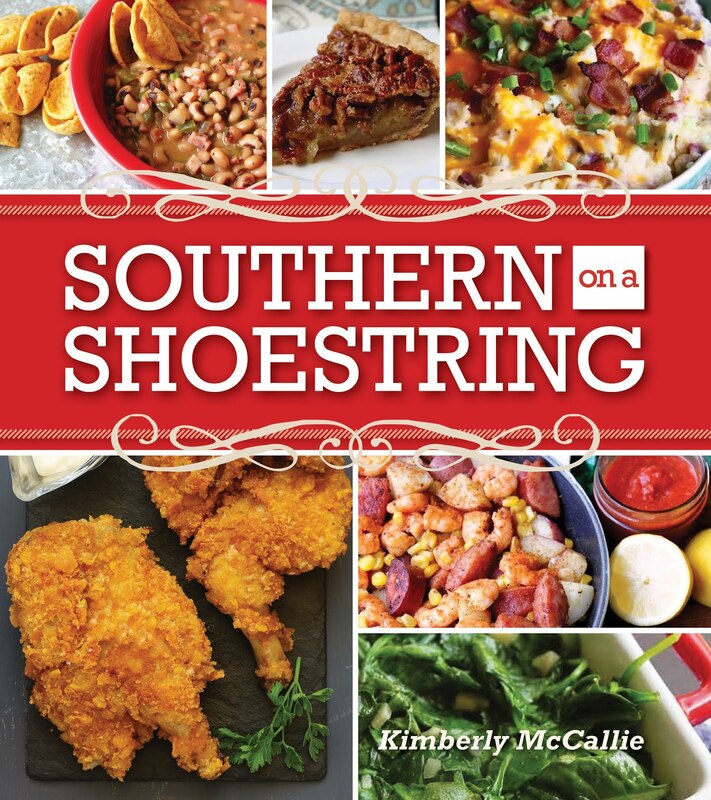 These dishes fit right in to the scheme. Brace yourself! We still use them. It's been 19 years and I haven't replaced them...yet. Why?!? Because I just didn't know what I wanted. I'm a pretty contented person. I don't do change well. Any numbers of reasons... But, the biggest reason for not replacing them is not knowing what I wanted to buy as a replacement. Duck Dynasty fans should be jealous! After blogging for almost three years and buying small "prop" dishes here and there, I've started to feel antsy for some new dinnerware - full sets, not a dish or two here and there. As I've become more familiar with different types of dishes and kitchenware manufacturers, I've finally made my decision. I've decided that I will replace these wildlife dishes with an American classic, Fiestaware. The Homer Laughlin Company that makes Fiesta was kind enough to send me this Mini Disc Pitcher to get me started. I chose the color, Sunflower, because it's so bright and cheery. This pitcher is the perfect size to use for breakfast. It holds the perfect amount of orange juice for the kids. I love the sturdy feel of the pitcher and the fact that it all one piece which makes it easy to wash. I hate pitchers that come apart and have pieces that are difficult to clean. When you're not using it for beverages, it makes a perfect vase to hold some flowers from your garden or from your husband as a "thank you" for letting him keep his dishes for almost 20 years! 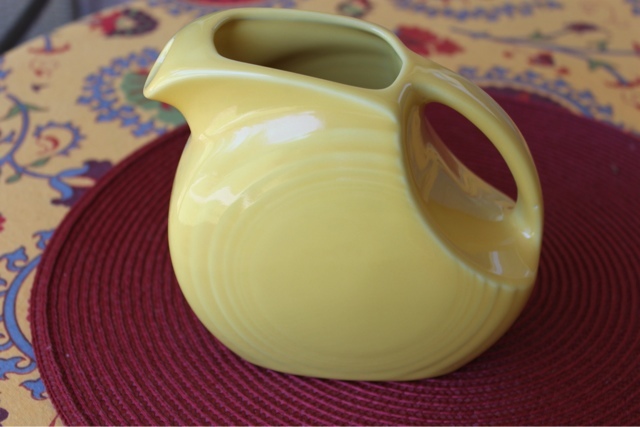 When I surveyed my Facebook readers about Fiestaware, they responded with enthusiasm! There are so many fans out there and I have become one of them. These are quality products made right here in the U.S.A. There's a huge selection of colors. I've decided to go with an assortment of colors for my dinnerware starting with Sunflower here and continuing with Lemongrass, Ivory, Scarlet, Paprika, and Plum. These dishes are affordable and I plan to purchase one set a time as I can afford them. It could be a slow process, but a satisfying one. I'll keep you updated to my progress. Are you a fan of Fiesta? Which pieces do you have? Let's dish! Disclaimer: Fiesta provided me a product to review, however, the opinion expressed here is my own. 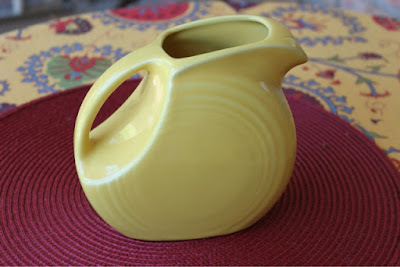 I started collecting Fiesta ware a couple of years ago, and let me warn you it's addictive! I love my dishes and and couldn't settle on one color, so I have several. 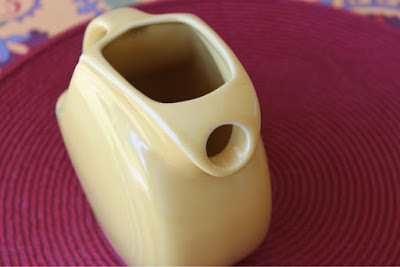 I have one of the mini pitchers in lemongrass and love it. We love our Fiesta! Had it for about 6 years. Have lots of colors, and many completer pieces. I have the square baker and just love it! I have some vintage Homer Laughlin, but no Fiesta Ware. As much as I like their older things, I'm afraid to get started on anything new, lest I be overcome with want-itis! I love my Fiesta dishes! Ever since I was a kid I admired them, and got it into my head way back then that I'd buy Fiesta dishes after I got married (weird kid, I know). Sure enough, I got many pieces of Fiestaware as wedding gifts and other gifts since then. Only been married for 3 years, but I have place settings in Turquoise (my favorite), Scarlet, Peacock, Tangerine, Shamrock, Plum, Lemongrass, Sunflower, and Lapis, plus multiple serving bowls, a platter, and a couple of the jumbo mugs. The Lapis is the newest addition, my mother-in-law gave it to me for Christmas and my mom gave me the Lemongrass place setting for my wedding anniversary. We use the dishes every day and even my husband loves them. Nothing has broken yet, all the dishes look new. They're so sturdy!